Start with San Clemente , with its fascinating layers. At the lowest level use a torch (flashlight) to appreciate the beautiful fresco of the head of a bearded man. Walk one block over to the Via dei Santi Quattro Coronati to glimpse the produce market; turn left and walk up the hill to Santi Quattro Coronati, a rich and little visited 4th-century church with remarkable frescoes in the chapel (1246). 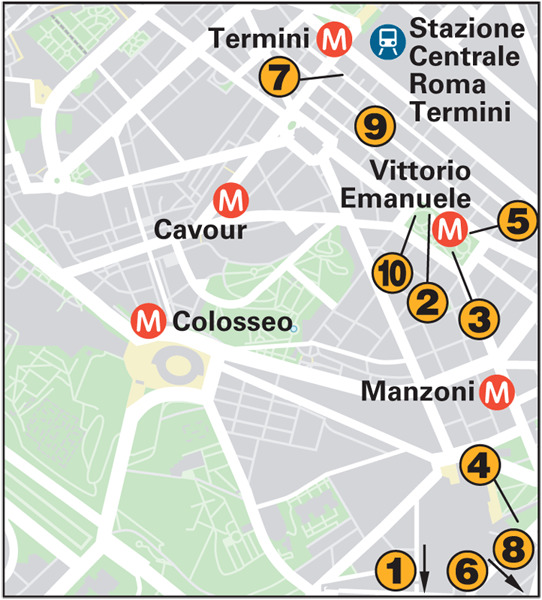 Continue on until you reach San Giovanni in Laterano . The cloisters with gorgeously twisted columns and mosaic inlays will make your visit truly memorable. For an equally memorable lunch, head to Cannavota . After lunch, it’s time for another of the great basilicas, Santa Maria Maggiore . Check out the ancient column in front and inside use binoculars to examine the 5th-century mosaics lining the upper reaches of the nave. Finally, cut over to Santa Prassede, where you can take in some of Rome’s most radiant Byzantine mosaics and a powerful painting of the Flagellation in the sacristy. 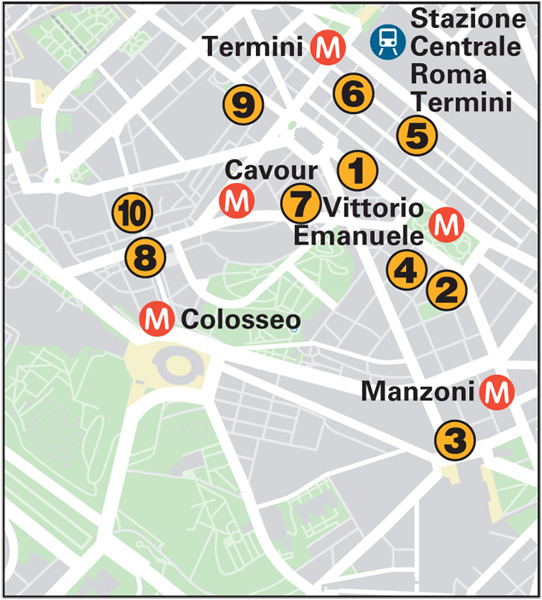 For sustenance after your spiritual journey, continue down the hill, past Santa Maria Maggiore’s grand staircase and enjoy a drink at L’Angolo di Napoli , or stay for a dinner of Neapolitan-style pizza. The market is a good bet for new leather jackets at great savings. Otherwise there is a lot of quite junky fakes, good-condition second-hand clothing, and other miscellaneous items . 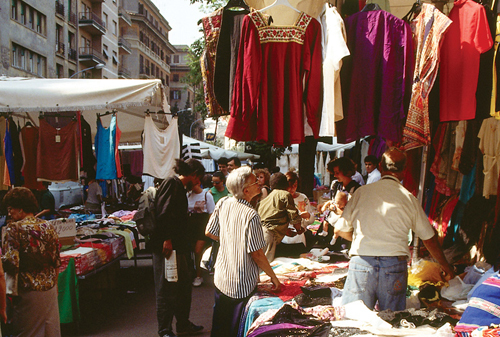 Exotic foodstuffs, spices, flowers, clothing, luggage – you can find all that and more around this huge market square. Under the porticoes there are even more stalls to check out . Fairly well-made clothing at bargain prices, plus a large selection of cosmetics and toiletries. This is the largest of several branches of Oviesse in Rome. A fashionable department store, with reasonable prices. It’s mostly clothing, shoes and accessories, but they also carry kitchenware and more general furnishings. MAS stands for “Magazzini allo Statuto” (“Statutory Warehouses”). Shopping here is like one vast rummage sale. There’s tons of merchandise piled up in bins, but the prices are ludicrously low and the staff are friendly and helpful. The lovely, hand-made leather shoes are good value for money. Stock includes boots, shoes and leather bags. A boot-stretching service is also available. A mid- to low-range department store that carries clothing, toiletries and practical items for the home. An extremely trendy clothing emporium with a factory outlet on the top floor selling Prada and D&G. One of the few places in the city where you can find Chinese, Thai and Indian spices and cooking pastes. One of many Chinese shops in Rome’s Chinatown. This one specializes in women’s wear. The eponymous couple divide the labour expertly, she as chef and he as maître d’. Try the menu degustazione for a sampling of each day’s masterworks. Reservations a must . Cuisine from Sardinia, which adds up to lots of fish and lots of flavour. A traditional neighbourhood restaurant. Try risotto alla pescatore (seafood risotto). This friendly, intimate restaurant serves creative dishes from the Marche region. The tagliatelle con ragù is excellent, and the house Verdicchio wine is above average. Booking in advance is advised. Seafood and fusion cuisine served by a bilingual staff. Rome’s best value Indian restaurant, is set in two attractive medieval rooms. Tandoori cooking is a speciality. This cosy wine bar has a full menu of hearty Tuscan soups, cous cous, tuna steaks and, for dessert, delicious carrot cake. A clubby old wine bar. Bottles from around the world to choose from, as well as a decent menu of salads, pastas, sandwiches and more. Head here for lunch in this light and airy establishment with cafeteria-style service. Great hot or cold buffet selections. Elegant Indian restaurant, a cut above the rest. The food is superbly prepared in north-Indian style.